February 2019, California. We've logged 15,000 miles in our Model 3 since picking it up ten months ago. This was our first trip in winter weather conditions. We don’t often get snow in my town. According to my neighbor it’s been 23 years since honest-to-goodness snow has fallen in our part of California’s Central Valley. But when we get the urge for snow we don’t have far to drive. In good weather without traffic the trip to the north shore of Lake Tahoe takes us about 2 hours. Last weekend we went on an annual trip with friends up to the mountains, and this was the first time we drove our Model 3 for this trip. 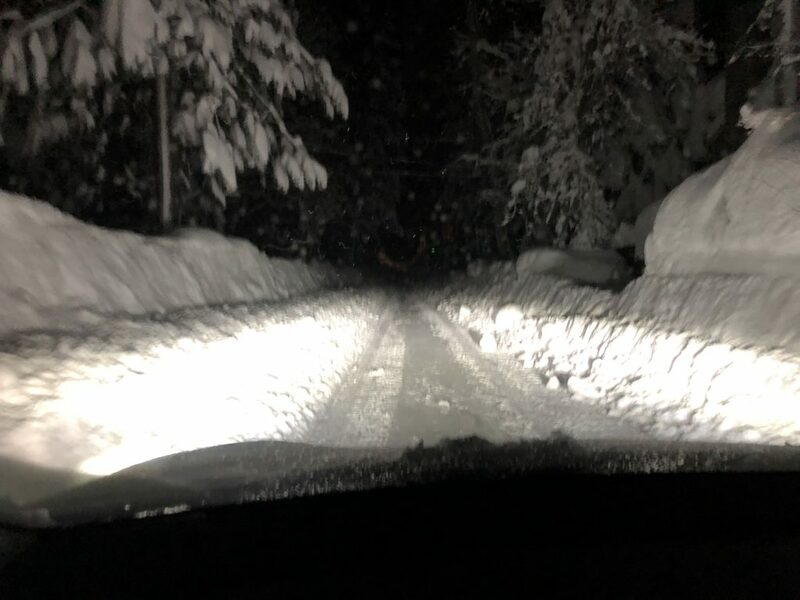 To make things interesting a large winter storm system called an atmospheric river was forecast to dump buckets of rain in the Central Valley and heavy snow up in the mountains. The forecasters got it right: several ski resorts ended up reporting nearly 100 inches of snow from this storm system. Getting up there was the challenge. Route 80 was entirely closed due to white-out conditions, strong winds, and near-zero visibility at Donner Pass the day before we left. The next day Caltrans reopened Route 80 and we decided to go for it. Our destination was about 125 miles and a 7200 foot climb up the western slopes of the Sierra Nevadas. We left home with 309 miles of rated range in the Model 3 and the navigator predicting an ETA of 2½ hours. The Model 3 navigator is pretty good at predicting ETA under normal conditions. We’ve driven through bumper-to-bumper traffic to San Francisco several times and the navigator’s ETA has been within 15 minutes of our actual arrival time. However, I’ve driven to Lake Tahoe in snowy weather, I’ve seen this movie, I knew we were in for a longer trip. We left home with 309 miles in the pack and high hopes of seeing snow. We were not disappointed. We had smooth sailing for an hour or so till Caltrans closed eastbound Route 80 due to icy conditions and multiple accidents. So we got off the highway in Colfax and meet up with our group of friends to grab an early dinner and plot our course. While eating our group navigator found a local route around the accidents and we decided to keep on going. I put tire chains on the rear wheels and we got back on the highway. Things looked good, light traffic, clear roads, a beautiful sunset, and then the fun began. Watching a beautiful sunset reflected on the western slopes of the Sierra Nevadas on our trip up the mountains. Heavy snowfall began after we climbed past 4000 feet of elevation. Freezing temps and heavy traffic compressed the snow into a very slick surface. We passed about 10 spin-outs, and many of these accidents stopped traffic while the cars were cleared to one side of the road. Heavy snowfall made for interesting travel. I was dressed for cold weather, and seat heaters and blankets were probably all our family needed to keep comfortable. But I had to keep the front windshield defroster on high to keep ice from freezing on the windshield wipers so we were plenty warm in the car. Traffic moved along at 20-25 MPH, when it was moving. I would not have wanted to drive faster anyways. 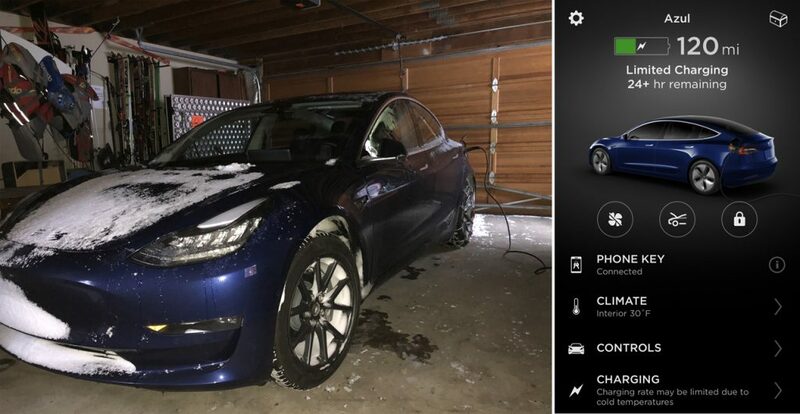 Our rear wheel drive Model 3 with tire chains handled the slippery conditions very well. If you’ve ever driven a rear wheel drive car in the snow with tire chains before this was not much different, but in my opinion you have better control in the snow with an EV. I’ve driven our front-wheel drive 2012 Rav4 EV in the snow before so I’ve experienced the fine control you have over vehicle torque in an EV as you climb hills. The rear-wheel drive Model 3 was no different. The even weight distribution of the battery pack over the front and back wheels undoubtedly helps with traction. 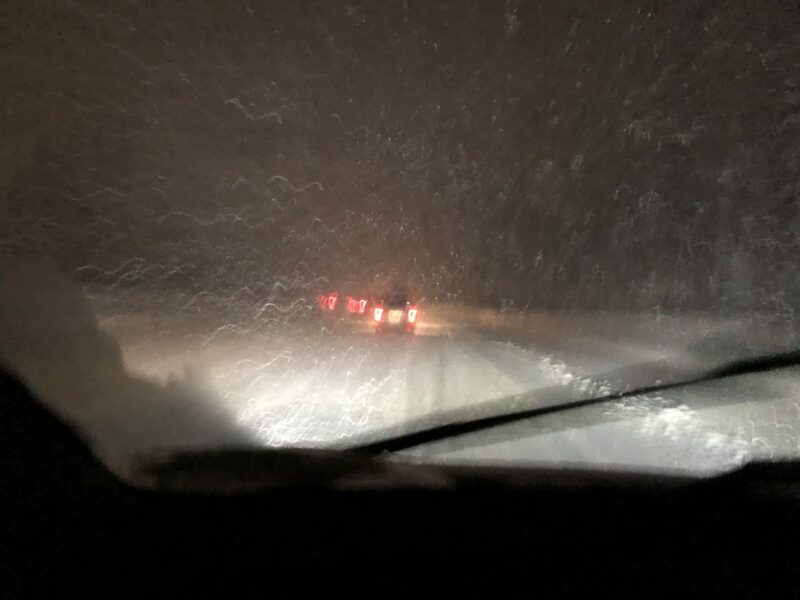 We started from home with 309 miles of rated range, drove 129 miles, climbed 7200 feet in cold, snowy conditions, with the front defroster heat on for the last five hours – oh, did I mention the trip took us 9½ hours? Including dinner in Colfax, yes, 9½ hours. But we arrived at our destination with 118 miles in the pack. So we used 191 miles of rated range for the trip – about 62% of the fully charged battery or ~46 kWh of energy from the pack. At no point was I concerned about range. 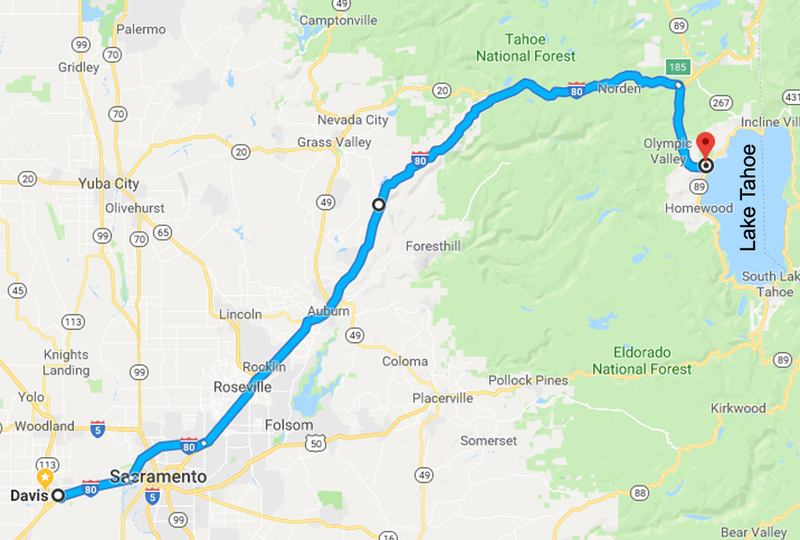 From previous driving in our Rav4 EV I knew the long range Model 3 was up to the task and I knew there were 2 Supercharger locations in Truckee if needed. I did not plan to use them on our way to Tahoe City and in the end we did not use Superchargers on this trip. For those traveling from further away there are Superchargers in Rocklin and Roseville along Route 80 if you wanted to top off the pack before getting to the mountains. We made it! We left home with 309 miles in the pack and arrived with 118 miles of rated range. Notice the snow on the hood after hours of driving? No ICE under there! We were fortunate that our friends left the garage open for us so we parked in the garage and plugged into a 120V outlet. I dialed the current down to 10 amps to avoid tripping the circuit. Over 2 nights we gained 90 miles of rated range from the 120V outlet. Even though the car was parked in the garage it was still below freezing in there – the snow and ice didn’t melt off the car. I needed to push the door handles a bit harder than normal to open the doors, and I needed to clear ice off the charging port so it would open. The kids had a blast in the snow, making the trip well worth it. The whole point of this trip was fun in the snow, and the driveway made a great sled run. 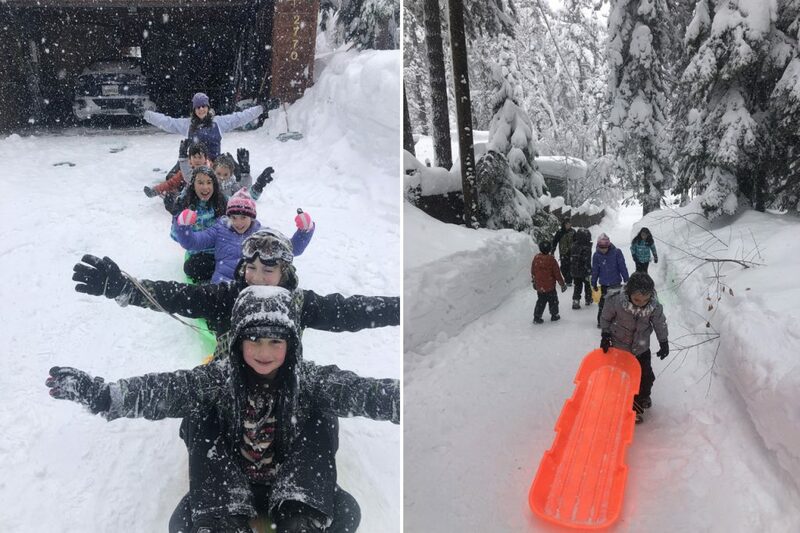 The kids had hours of fun sledding and playing in the snow. 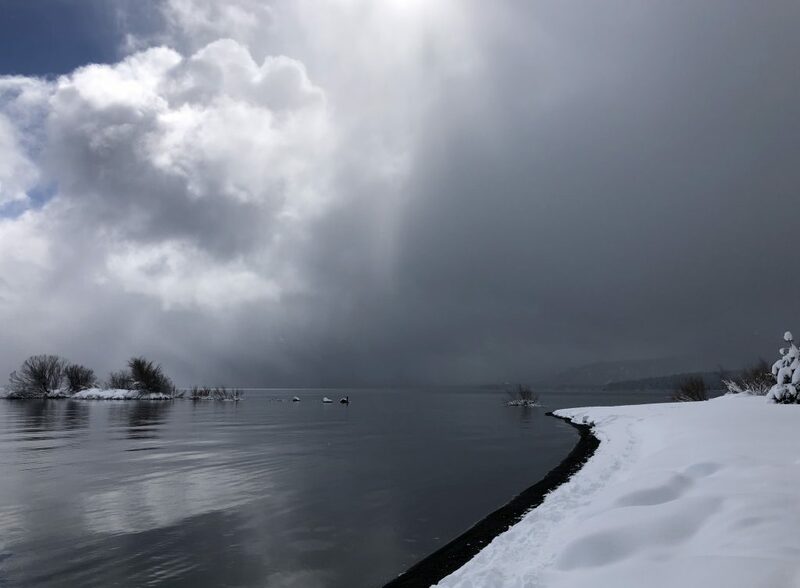 We were very close to the lake and walked through deep snow along the shore to enjoy the quiet snowfall and beautiful views. Beautiful walks along Lake Tahoe. After time well-spent with good friends in a beautiful location , it was time to head back home. Lucky for us that trip was uneventful and much quicker. 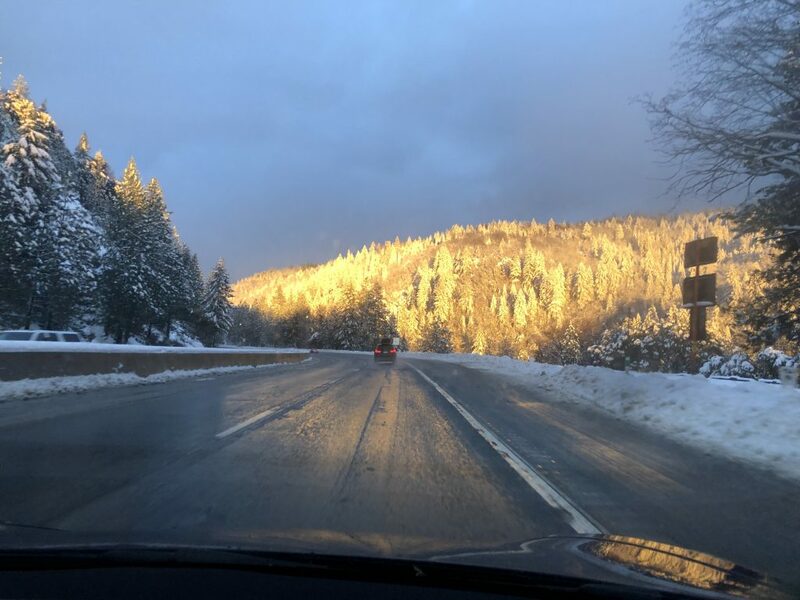 We started out in chilly 18°F winter weather in Tahoe City, took off the chains in Truckee, and descended 7200 feet over 125+ miles to arrive home to sunny 55°F weather. Location matters. We left Tahoe with 208 miles of range, drove 129 miles and arrived home to a sunny 55°F and 128 miles of range remaining in the pack. We started our trip to Lake Tahoe with 309 miles of range. We drove 129 miles in comfort* through cold, heavy snow while climbing 7200 feet, over 9+ hours, to arrive with with 118 miles in the pack. The 129 mile trip up the mountain used 191 miles of rated range. A lot of that energy went to working against gravity as we climbed the mountain, and some of the consumption was dedicated to heating the cabin and battery pack in cold weather. The return trip downhill used only 80 miles of range. Knowing that Tesla’s Supercharger network was there if needed gave us the confidence to take this trip without hesitation. 120V charging added 90 miles to the pack giving us 208 miles for the return trip. Otherwise we would have stopped at the Truckee supercharger for 15 minutes on the way home. I think we’re at the point where you don’t have to say the Model 3 is an EV, it’s a car, and a damn good car at that. *Comfort: in terms of temperature and seating… a 9½ hour car trip is not my first definition of a pleasure cruise. 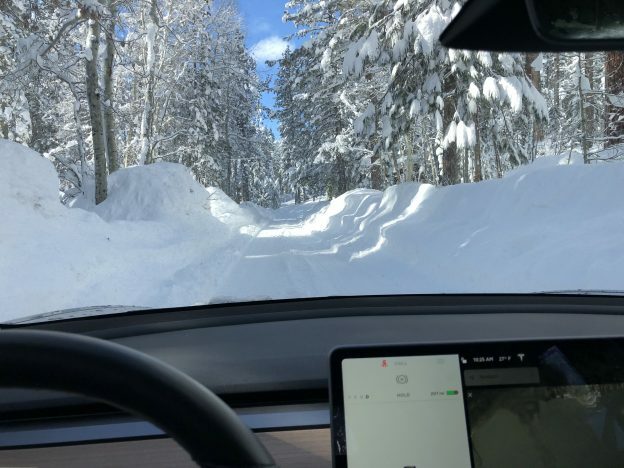 This entry was posted in Personal Posts and tagged atmospheric river, Electric car, EV, Model 3, rear wheel drive, Skiing, snow, Tesla, tire chains, winter, winter weather on February 20, 2019 by Steve Noctor. 2017 Chevy Bolt EV: A Changing of the Guard? A Tale of 9 Hours: Does GM Really Want to Sell the Chevy Bolt?